Music Movies | WHAT A FEELING! As sad and romantic as its evocative title, Let’s Get Lost is a documentary about the great jazz trumpeter Chet Baker, whose death in a fall from an Amsterdam hotel window in 1988 was the final step in a lifelong dance of self-destruction. Much of the movie was shot in 1987, when Baker was clearly near the end of his long, painful road. 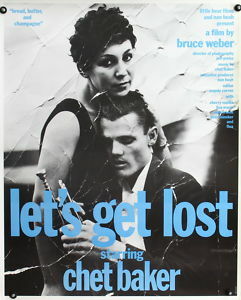 Let’s Get Lost is no straightforward documentary. Filmmaker Bruce Weber, a longtime fan of Baker, has created a dreamlike, black-and-white collage of interviews, music, old photographs, film clips, and new footage. It tells Baker’s history, but also conjures the feeling of a long, mournful jazz wail. In the 1950s, young Chet Baker was a great white hope of jazz, a key figure in West Coast cool jazz, a beautiful trumpet player and a wispy, romantic vocalist. He also looked like James Dean, and Hollywood was grooming him for stardom. He had talent, he had charm, he had…something ineffable. William Claxton, whose famous photographs of Baker in the ’50s are featured prominently in the film, says that photographing Baker gave him his first indication of what photogenic meant. These early glimpses of the young Baker are interspersed with the wreck Weber interviewed in 1987. Baker, not yet 60, looks like an angel of death, his face heavily lined and toothless, his spirit shredded by constant drug use. Interviews with his wives, girlfriends and children create a portrait of a master manipulator, a totally unreliable friend and father. Some will see this film and dismiss Baker as a self-destructive jerk. Fine. But that doesn’t explain the music, which is as graceful and fugitive as a trail of smoke. Baker seems to have been a person so racked with pain and hurt that he was simply unable to function in the world, except to express himself through music. Bruce Weber is a fashion photographer whose Calvin Klein campaign set the tone for advertising in this decade. As a filmmaker, he’s still drunk on images: the story in Baker’s face, the glamour of the jazz set in the 1950s. (This movie is unimaginable in color.) Weber may be mostly concerned with surfaces; he can’t explain Chet Baker. But he can fashion Baker’s dream state, his lost world. Slightly surprised this isn’t considered more of a classic documentary, but maybe it doesn’t fit the mold; also, it was out of circulation for a long time. The treatment fits the subject, for sure. The Little Mermaid is No. 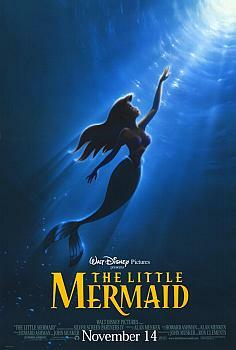 28 in one of the movies’ great traditions: It is a full-length animated feature from Walt Disney studios. And, like many of the films Uncle Walt supervised, it is based on a classic fairy tale. It’s a loose adaptation of the Hans Christian Anderson story (one that ends rather more happily in the Disney version). ‘Tis the tale of a mermaid, Ariel (voice by Jodi Benson), who falls in love with a prince and dreams of joining him in the world above the sea. To do this, she would have to sprout legs, which involves driving a hard bargain with a dreadful sea witch, an octopus called Ursula (Pat Carroll). Ariel also runs the risk of displeasing her father, a ruler named Triton (Kenneth Mars). As is the Disney wont, there are some cute characters who play off the heroine (and who, to speak more cynically, make themselves very available for mass merchandising). Flounder (Jason Marin) is, as you might guess, a fishy friend; Scuttle (Buddy Hackett) a frequently confused seagull; and Sebastian (Samuel Wright), the Jiminy Cricket of the movie, a musically inclined crab. After an opening reel in which it appears the movie might drown in cuteness, The Little Mermaid begins to swim in its own high spirits. The vernacular is modern and the songs (by Alan Menken and producer Howard Ashman, the team who created the musical Little Shop of Horrors) are fun, particularly the two Jamaican-flavored numbers sung by Sebastian. There’s also a funny patter song by a French chef (at the prince’s castle) who warbles on about the joys of cooking—horrors!—seafood. But, as is so often true, the movie is stolen by the villain. The great purple-and-black octopus Ursula is the Disney animators’ triumph, a rolling mass of tentacles, each of which seems to have its own life. She taunts the goody-two-shoes Ariel with her devilish bargain; later, when she takes the form of an above-water maiden, she surreptitiously kicks the prince’s dog. Hissing is allowed. The film is directed and written by John Musker and Ron Clements, who also created Disney’s enjoyable The Great Mouse Detective. Their assured work, which manages to be both respectful of tradition and just a bit hip, plus the top-notch achievements of the younger animators, bodes well for the future of Disney’s most cherished legacy. Well, yes, it’s an understatement to say that it worked out well for Disney after that, animation-wise. In that sense, the turning point that The Little Mermaid represents makes it one of the more significant movies of its era—this was the moment Disney went from being a moribund dinosaur to a giant player again. This is also a chance to remember how important Howard Ashman was to Disney’s turnaround; by most accounts he had a lot to do with making The Little Mermaid a smart movie. Metropolis first became a gleam in Fritz Lang’s eye when the great German director visited New York City in the mid-1920s and was dazzled by the skyscrapers of Manhattan. Lang spent the next two years—and a whole sackful of his studio’s money—creating a futuristic movie about workers struggling against inhuman overdeveloped “progress” in the year 2028. Audiences were even more dazzled by Lang’s majestic vision. When it came time to export the three-hour film, however, somebody decided that overseas viewers would benefit from a shorter version. These original exporters thought it best to cut out a character named Hel, for instance, because they feared American audiences would misunderstand the name. Hel just happened to be the mother of one of the main characters, but never mind about that. So English-speaking audiences have never seen the full-length film—and they never will. Too many pieces are lost for good. But the film has been restored to as full a length as possible by extremely surprising hands—those of disco maestro Giorgio Moroder, he of Flashdance and American Gigolo. It seems Moroder got the idea to give Metropolis a vibed-up soundtrack, but he got sidetracked. He started hunting down bits of the movie that had fallen out along the way. This reissue of Metropolis, then, is Moroder’s unique contribution to film history. He’s gotten some of the movie off the shelves of collectors. He’s also given it a rock music score, complete with Pat Benatar, Adam Ant, and Bonnie Tyler. Now, that rock score, in theory, sounds pretty cringe-worthy. And in fact, some of it stinketh. The songs, which feature lyrics that stupidly comment on the action, are somewhat obtrusive. But the instrumental music is often quite good, and certainly does not seem outrageously out of place in Lang’s bizarre dream world. Ultimately, the movie rests and falls on its visuals. It was shot as a silent film, and can thus presumably stand on its own. Does it? The answer from this reporter: an unqualified, slack-jawed, weak-kneed Yes! Wow! What a movie. The theme, as stated, is basic: “Between the head and the hands, the heart must mediate.” The head is the ruler of Metropolis, Joh Frederson (Alfred Abel), who runs the city from his office high among the skyscrapers. The hands are the workers, who exist in slavery in horrific quarters deep below the city. The heart comes into play when Frederson’s son (Gustav Frolich) has his consciousness raised by the presence of a good woman (Brigitte Helm), despite the efforts of a mad scientist (Rudolf Klein-Rogge) to stop them from leading the workers to the light. Lang visualizes this simple theme with astounding ingenuity that goes beyond the spectacular production values. But oh those production values: the huge underground city, the transformation of a woman into a robot, and—would you believe 11,000 bald-headed extras constructing the Tower of Babel? Frolich is something of a wash-out in the lead role, and Abel’s part seems shortened by the original editing. But two of the performers have been immortalized by their roles. Klein-Rogge is the ultimate mad scientist, and Helm is disturbingly weird as both the Lillian Gish-like good girl and as the lusty, utterly crazy robot. The film has, for years, been called a prediction of the rise of Nazism. It’s interesting to note that Lang, who was sometimes accused of being a dictator on the set, left Germany in the early 1930s after Nazi Minister of Propaganda Joseph Goebbels invited Lang to make official party films for the National Socialists. Thea von Harbou, who wrote the humanistic message of Metropolis—and was also Lang’s wife—stayed on and worked for the Third Reich. Historical considerations aside, Metropolis is a spellbinding movie experience. Even with Moroder’s win-a-few, lose-a-few soundtrack, it puts the current competition to shame. That’s Dancing! isn’t much of a movie—but then it doesn’t have to be. It provides plenty of entertainment by helping itself to large portions of other movies, many of which are very good indeed. It’s the approach taken by the That’s Entertainment! movies (they’ve even kept the exclamation point), but in this case the musical numbers consist only of dancing—no extraneous material. The dance numbers from the history of the movies are introduced and narrated by Mikhail Baryshnikov, Ray Bolger, Liza Minnelli, Sammy Davis, Jr., and Gene Kelly. Kelly also served as executive producer. Kelly and Jack Haley, Jr. (who also was responsible for the That’s Entertainment! films), start the film—after a gratingly splashy opening number—with a chronological history of dance in film. Early nickel flickers and silent extravaganzas are glimpsed. Then that mad choreographer-director, Busby Berkeley, is showcased, with wild clips from some of Berkeley’s 1930s Warner Bros. musicals. Some of this stuff, which really makes you wonder what kind of medication Berkeley was taking, is reason enough to stay up for late-night TV and catch these films in their entirety. Fred Astaire is duly honored, of course, including his solo to the ironic strains of “I Won’t Dance.” We also get to see a dance from The Wizard of Oz that was trimmed from the final release version. It’s an extension of the Scarecrow’s “If I Only Had a Brain” dance, and it’s perfectly delightful—nothing great, mind you, but with Ray Bolger bouncing between rubbery fence posts and flying over the corn fields, it certainly qualifies as a wonderful almost-lost nugget of Hollywood history. A section on classical ballet in movies follows, and this is the point at which That’s Dancing! goes astray. A bit too much time is spent paying tribute to classical greats, many of whom had little to do with dance in movies. This is also the point at which the film abandons its chronological movement, becoming instead a tribute to the key stars of the genre. Thus the movie seems directionless, although it’s hard to care much when the clips are this good. There’s a sensational duet of one-upmanship by the Nicholas Brothers, from Down Argentine Way; a hilarious bit from It’s Always Fair Weather with Kelly, Dan Dailey, and Michael Kidd hoofing it up with the handicap of a garbage can lid attached to each foot; and the sizzling “Cool” from West Side Story. The narrators take pains to tell us who the principal dancers are, and even the directors and choreographers. For some reason, and this is unfortunately common in compilation films such as this, there is no written identification of each clip. It’s always nice when a title is flashed at the bottom of the screen when a scene comes on, but maybe they thought it would be too complicated for the audience. Hmm. Yes, for some reason this one didn’t catch the giddy magic of the first couple of compilation films under this banner. In the 1970s the first two That’s Entertainment! movies were big box-office hits; but they’re all museum stuff now. The release of Eddie and the Cruisers was one of the oddest in Hollywood history. The film flopped upon its original release in 1983, then turned up a year or so later on cable television. Suddenly it was one of the most popular movies on pay-TV, and sales of the soundtrack album went through the roof. But even such belated success called for a sequel, and Eddie and the Cruisers II: Eddie Lives is finally here. The mystery of the first film was whether Eddie Wilson, a rock ‘n’ roller with one hit album to his credit, really did die in a car crash in 1964. His body was never found, and there was a suggestion that he faked his own death. Eddie Lives answers this question in no uncertain terms. Yup, he’s alive all right, and living as a construction worker in Montreal (and once again played by inexpressive Michael Paré). Nostalgic Eddiemania is sweeping North America, and a set of previously unreleased tapes is being marketed as the new Eddie and the Cruisers album. Sleazy record execs are encouraging the rumor that Eddie is still alive. This peeves the real Eddie. He begins to play again, with a bar band, and polishes up some new songs. Meanwhile, he hooks up with an artist (Marina Orsini), who may serve some function in the story although she appears to be there mainly to hang on Eddie’s arm. Eventually, Eddie heads back for the spotlight and his unmasking. What a crummy movie this is. It plays a series of disconnected scenes, marked by clichéd dialogue (“It’s the music that counts! Not the hype!”) and lifeless performances. Eddie himself is an entirely unappealing character, pompous and sour. That review seems to cut off in mid-thought and apparently was shortened for space, so my no-doubt devastating finish will have to remain a mystery, much like the original Eddie himself. 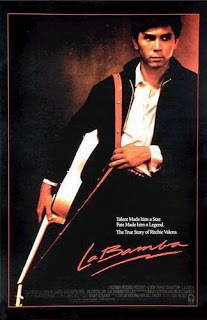 The first film probably does deserve a place in history as the first example of the home-video revival of a flop picture, which meant that we all had to suffer through the faux-Springsteen music for a couple of years or so. On a crisp Colorado night in September of 1982, I was walking along the main street of Telluride, where the annual film festival was in full swing. As I approached the outdoor theater—not a theater, really, just a grassy space with a screen hung across the starry night—I heard some incredible music and stopped to look at the movie being projected there. What I saw was an amazing, mad rush of images: time-lapse photography of clouds scudding across a city skyline, speeded-up shots of escalators vomiting people through a shopping mall, fast-motion images of cars racing over strips of highway like ripples on a snake’s back. What I was seeing was Koyaanisqatsi, a remarkable film by a man named Godfrey Reggio. Reggio’s non-narrative movie is composed entirely of arresting images and the rhythmic, trance-inducing music of Philip Glass. Koyaanisqatsi—the title is a Hopi Indian word meaning “Life out of balance”—quickly became many things to many people. It was a touchstone to other filmmakers, including Francis Coppola, whose Rumble Fish was markedly influenced by it. It was the ultimate MTV movie. It was a head trip. It was a New Age lullaby. 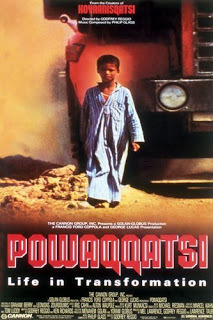 Reggio himself simply went out and made the next installment of what he plans as a trilogy, Powaqqatsi, and it is in the same manner as the first film. But in Powaqqatsi Reggio ranges much farther through the world to find his images. This time more of the movie focuses on the Third World (filming took place in Kenya, India, Egypt, Nepal, Peru, and elsewhere), and Reggio opts for many slow-motion sequences. The most bravura sequence is the opening, as Reggio surveys the slowed-down, dreamlike efforts of workers to haul stones and mud from a quarry (Glass’s music is particularly forceful here). Again like the first movie, Reggio uses the progression of images to suggest the soullessness of mechanization, as opposed to the simplicity of primitive life. In the Hopi language, Powaqqatsi translates as the sorcerer who lives by consuming other ways of life. Reggio makes his point, but you have to wonder how aware he is of the irony of using ultra-sophisticated film stock and helicopter shots as he glorifies the peasant grinding corn with a rock. And in some ways, Reggio’s films seem to encourage a mindless sensory experience rather than political awareness. The interesting thing about Reggio’s two movies is that they are larger experiences than either his social concerns or my critical quibbles. Quite simply, Reggio finds ways of looking at things that no one else has seen in exactly this way before: a pink tree alone in a terraced yellow-and-green flower garden, a man lugging a fish as large as he is to market, a child ferociously driving a horse-drawn cart through a street, a Nepalese house perched on what appears to be the top of the world. The mandate of the artist is to show us things anew; at this, Reggio succeeds. This one, which never quite matches its opening, was considered a dropping-off from the K-movie. But it looks good next to Reggio’s 2002 film Naqoyqasti, which crossed the line into hectoring. You are currently browsing the archives for the Music Movies category.